Chemical applications to vineyards are currently based on land area. New technology that takes into account foliage dimensions will save on chemicals and reduce impact on the environment. Current agricultural practices mean that air-assisted spray machinery is based on a continuous but random mixture of air and chemicals. Tree dimensions and environmental conditions are not taken into account, leading to waste, and worse, over-application of dangerous chemicals. The EU funded project TEVINS took up the challenge of developing variable rate technologies that makes smart decisions on the amount of chemicals and air flow rate applied in real time. A foliar detection system determines the dose according to density, volume and spacing of foliage. "Given that traditionally such decisions are made on a field-by-field, rather than plant-by-plant basis, the opportunities for efficiency are clear," points out project coordinator Mr Ferran Iturbe Recasens. The new TEVINS technologies are accompanied by Big Data analysis of orchard and environment status that will transform chemical applications into a user-friendly, appropriate-to-needs activity. The main result will be an increase in high-quality marketable products for human consumption. A cloud-based interoperability platform with Big Data sensor analysis and 3-D crop modelling capabilities emulates the orchard status and gives feedback to the decision support system integrated in the control computer and user interface. 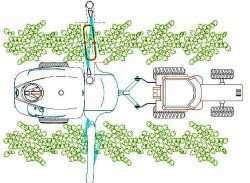 "Generating variable prescription maps, this is valuable not only for spraying operations but also for other orchard operations such as pruning and crop thinning. Ultimately, TEVINS is designed to put data-driven analytical tools where they should be, in the hands of farmers," explains Iturbe. Integration of other existing smart equipment such as water/humidity sensors on farms is anticipated. "Properly implemented, the result will be sustainable production with traceable data records from the field to the food chain." Technological challenges addressed were related to the algorithms needed to develop a variable rate spray system for a highly dynamic flow rate range. Calculated by the decision support system in real time, these are based on the machine's vision system for measurement of vegetation indices. Demonstration of cost efficiency of precision spraying in horticulture and promotion of use of new technologies to small farmers is a complex task. The answer is to pitch the sales strategy with direct sales to existing customers and an already developed sales distribution network. Teyme Tecnología Agrícola SL, the coordinator, already distributes machinery for vineyards. Internet-based sales channels like Twitter will be used to communicate product features and benefits to new customers and influencers in the market. Also targeted are manufacturers and trade associations that will testify to the advantages of using the precision sprayer. After successfully completing the TEVINS project and fulfilling all the objectives, the company's intention is to bootstrap technology transfer with development of other lines such as super-intensive olive and almond plantations. Adaptation of the technology should be fairly straightforward due to the similarities of the crops in terms of canopy and foliage detection. "Due to that reason, we reckon the new systems will be ready for commercialisation in year three of TEVINS vineyard and orchard sprayer commercialisation plan in 2021 after all-important testing and validation," says Recasens summing up the financial projection and expectations for the new product. Not only does the new sprayer technology cut costs and help the environment, the TEVINS system will help farmers to embrace cross-compliance in the context of the Common Agricultural Policy. Developed in line with the environment, food safety, animal and plant health and animal welfare standards that farmers must adhere to, will aid growers to successfully apply for EU subsidies.